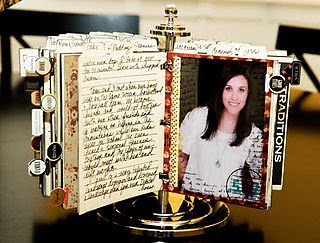 The fabulous Sande Krieger made this absolutely stunning recipe holder for CHA in July. We were stunned by the sheer amount of cards as well as the fabulous stories that she included in this piece. It was made from photo carousel index tabs in Manila, transparencies, and the clear stamp set Take Note as well as other bits and pieces. 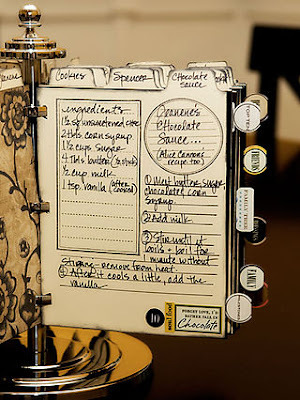 Each recipe has a picture of the person who gave it to her (some people have more than one recipe after their name), with the persons name on the tab at the top of the card. 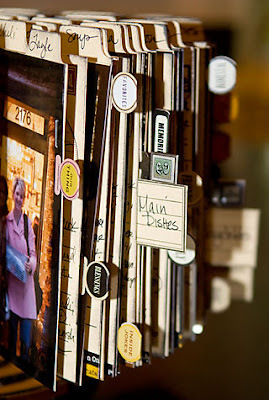 She added a transparency over the pictures to make them stand out from the recipe pages since they all have the tab at the top. So the tabs all have either the persons name or what the recipe is; soup, salad, cookies, etc. And even more fabulous is the fact that on the back of the pictures she wrote about each person...sometimes how she came to get the recipe or why the recipe was important. All just tidbits of information that we normally don't write down or journal. section into main dishes, dessert, etc. I knew you'd like this one! Two more days to send us pictures of your spinner and get in on some gypsy goodies we're giving away on Friday! i love it!! 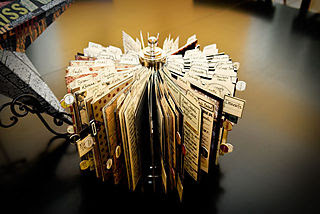 that is such a great idea using the carosel for a recipe card display!! OMG! these are amazing, this is my next big project! Love love love this to bits!! Cannot wait to try my hand at a version!! Love your blog to bits!! Where can you find the spinner? I found the spinners on EBay but going for $224.... crazy!